In British Columbia, salmon are sacred. For centuries, they have nourished First Nations and settlers alike, and continue to sustain virtually all of the wildlife we cherish in B.C. : orcas, eagles, bears, seals and sea lions, wolves and even our forests. Wild salmon make life possible on the West Coast. So why are our federal and provincial governments trying to kill them? I do not speak of simple neglect. I mean actively working towards the destruction of wild salmon. A salmon heads upstream in the Klamath river. So why are our federal and provincial governments trying to kill them? I do not speak of simple neglect. I mean actively working towards the destruction of wild salmon. At first, the idea might sound far-fetched. But remember, we live in the age of climate change denial, Bill C-51 and robo-calls, where diabolical government plots have become an everyday fact of life. Consider then, that salmon habitat extends all the way from the open ocean, tracing our coastlines and estuaries, into our many rivers and branching out into a network of spawning grounds that reaches almost every corner of the province. That means that virtually every new resource development project -- be it a tar sands pipeline, LNG port, fracking well, mine or coal port -- impinges on wild salmon habitat. To the resource extraction industry, wild salmon are nothing but an obstacle; a nuisance that cause increased costs and project delays, through environmental assessments and the like. And unfortunately for wild salmon, removing obstacles for the resource industry is what our federal and provincial governments do best these days. But they aren't the only ones with something to gain from the disappearance of wild salmon. The Norwegian and Japanese salmon farming corporations operating along our coast would shed few tears over the elimination of their only competition (a healthier, better tasting one, at that). And it could hardly have escaped government notice that open-pen salmon feedlots represent one of the gravest threats to the health of our wild salmon populations. Is it any wonder then that ocean-based salmon farming is the darling industry of our Department of Fisheries and Oceans (DFO)? In 2012, Stephen Harper removed environmental protections from 99 per cent of our lakes and rivers. Among them, the Upper Fraser and Kitimat rivers, both critical salmon and steelhead habitat that just happen to lie in the path of the Northern Gateway pipeline. Three years later, 74 of the 75 recommendations made by the 18-month, $26 million Cohen Commission Inquiry into the state of the Fraser River Sockeye have yet to be acted upon. In many cases, as noted below, the provincial and federal governments have actually done the opposite of the recommendations. In 2012, Harper eliminated the requirement for environmental assessments for all but major resource projects. This includes run-of-the-river hydro projects, which can divert up to 95 per cent of a river's flow into a tunnel or pipeline and can critically impact salmon. In every country where ocean-based, open-pen salmon farming has taken hold, wild salmon populations have collapsed. While the expansion of the aquaculture industry is a key priority of the DFO, protection of wild fish isn't even mentioned in their mission statement. Although the Cohen Commission recommended a moratorium on new salmon feedlot tenures along salmon migration routes, the B.C. government is considering at least 10 new or expanded licenses, almost all directly in our wild salmons' pathways to the open sea, exposing them to the feedlots' disease and parasites. Instead of the usual year-long licenses, the Harper government is now offering salmon feedlot operators extended nine year licenses that will leave our salmon at risk from foreign corporations long after the next federal election. 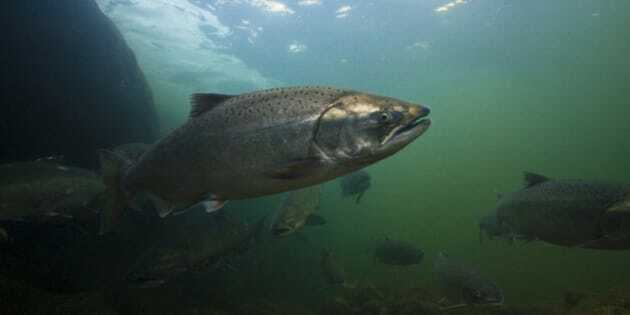 For decades, the Federal government has let foreign salmon farming corporations knowingly place salmon infected with viruses linked to deadly salmon diseases, in pens situated along the migration routes of wild salmon. At the same time they permit salmon farmers to introduce new salmon viruses into our coastal waters, the DFO has muzzled its scientists when it comes to talking about wild salmon diseases. When biologist Alexandra Morton and colleagues found the deadly ISA virus in wild B.C. salmon, the Canadian Food Inspection Agency (CFIA) confiscated her samples and publicly declared they were unable to repeat her results. A year later, they privately admitted they didn't actually test the samples. The CFIA took a further step to prevent the detection of salmon viruses by stripping the certification of the laboratory that detected the ISA virus -- Canada's only certified laboratory. The B.C. government recently permitted the use of hydrogen peroxide baths in salmon farms to try to control sea lice. Yet there is no research on what this chemical will do to the tiny migrating wild salmon forced to pass the farms. In 2014, the Harper government blocked an inquiry by the environmental dispute body established under NAFTA to determine if it had failed to protect wild salmon from the dangers of salmon farms as required in Canada's Fisheries Act. The federal government is now proposing a revolutionary change to the Fisheries Act that will grant foreign corporations like Mitsubishi the unprecedented privilege of owning fish that live in our ocean. This is a serious blow to the law of the commons, where the fish in our oceans are a resource shared among all the citizens of Canada. The proposed changes to aquaculture regulations will also grant salmon feedlot operators the authority to kill wild salmon to "protect" their farmed fish from disease. Still other changes to the aquaculture regulations will allow salmon feedlot operators to release "deleterious substances" -- antibiotics, pesticides, insecticides and other drugs directly into our coastal waters, directly in the path of migrating wild salmon. The primary industry putting our wild salmon at risk receives massive government subsidies. Salmon feedlot licenses, which cost about $1 million in Norway, are free in Canada. But diseased fish aren't -- the federal government buys them all from feedlot operators for up to $30 each. Taxpayers paid close to $50 million for dead, diseased farmed salmon in one year alone. At the same time they are ramming tarsands pipelines down our throats, the federal government is closing coast guard bases that act as first responders when trouble hits. Witness the bunker fuel spill in Vancouver last month or our Coast Guard's inability to save a stranded vessel off Haida Gwaii in January. We cannot sit idly by while our most important, iconic species is sacrificed for the sake of corporate greed. So it is time for British Columbians everywhere to stand up for our wild salmon. Tell B.C. Senator Nancy Greene Raine, a member of the Senate committee reviewing aquaculture regulations that you oppose the proposed changes to the aquaculture act and want salmon farms off our coast. Sign the petition to stop salmon feedlot expansion in BC. Join the farmed salmon boycott. And support the work and research of Alexandra Morton, without whose tireless efforts, we may already have lost our most precious resource of all.